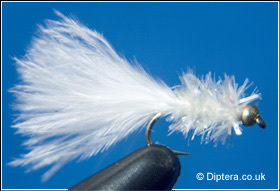 The White Fritz works superbly when fished using various rates of retrieve. The pattern can also be tied in a mass of colours from dark to very bright on the colour spectrum. The darker coloured fritz's are usually fished more slowly than the lighter coloured ones. The White Fritz lure comes into its own in the fry season.